It had been always asked by my Hindi lesson followers on YouTube & also on Facebook from around the world to collect and list out all the possible Hindi verbs with meaning in English language. Here is my attempt, now you can learn all Hindi verbs lists with English meaning and also with audio Mp3 for each verb separately so that you can learn how to pronounce each and every Hindi verb individually. Right now there are about 170+ , within few days I will raise it to a list with 200 + most spoken Hindi Verbs. 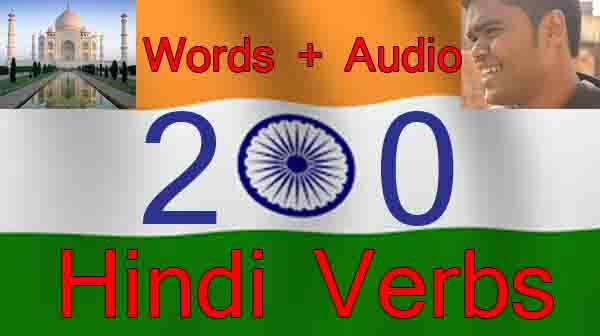 The reason for creating audios for all Hindi verbs list is knowing the correct pronunciation is very crucial thing in spoken Hindi, because you will see so many Hindi verbs with similar sound also they look same while writing in English, but when you read or pronounce well reading Devanagari , you will find the difference. As you start reading and listening these all Hindi verbs list with English meaning , please master in one verb till you get very close pronunciation like native Hindi speaker, don’t jump for next one, that is what the reason I put so much effort on making this Hindi learning audio podcast. Complete one Hindi verb from the whole list of basic Hindi verbs then jump to next one. You can keep repeating and speaking same time with me again and again. You can make plan to learn all this verb as well. Learn 5-10 verbs from the list given below at one day and continue doing this for 30 days. You will learn all basic Hindi verbs list with meaning in English language. More audio clips I am adding very soon. I need some time to develop and upload them on server. 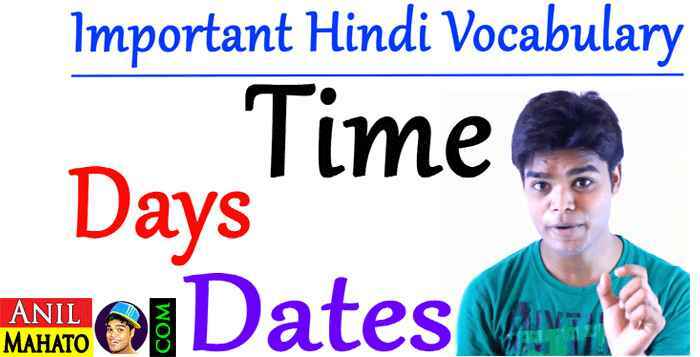 If you like my Hindi lesson then please don’t forget to hit the like button and share. You catch me on social media and subscribe to my blog and daily video tutorial on YouTube. you are edu-vlogger or edu -blogger. I am confused. Thank you so much didi ! hello sir, you are amazing and I really really like your videos but just one thing you overact sometimes. u r doing a gr8 job nd making proud for our nation nd culture….. i salute u nd proud of u…….. Check this link brother, this will help you type in Hindi. Anil u r doing a fantastic job. Best wishes my frnd. thank you so much. its very useful for me tounderstand hindi. Anil Ji, aapka hindi siksana bahut accha hai 🙂 sukhriaah bhai!!! Dhanyavaad Vijaya bhai, Mujhe Ye Jaankar Khushi Huee. I WILL CONFUSED IN GRAMMER. PLZZ HELP ME….IF YOU CAN…??? I M CONFUSED ABOUT GRAMMER. Anil, much thankful for your blog. You are a good Guru. I am a beginner who want to learn much more about Hindi. Frankly, it caused by Mahabharata film ..;). Because of Shaheer Sheikh..hihi. In spite of that I will try do my best to study your language, Anil. Renni, I am very glad to hear that you are interested to learn this beautiful language , Maharabharat is the greatest epic in the world, I am sure you already know about the stories of it. Along with Shaheer Sheikh, Mahabharat , once you know Hindi , you will also be able to understand most of bollywood Hindi songs and movies…. infinite possibilities will open for you Renni jee, I am glad you liked my blog. Hi Anil this is a beautiful well put together website and I appreciate you taking the time to help us all around the world. Love your videos as well. Don’t change who you are 🙂 you have a great personality! Thank you so much Kamila is for appreciating my work, I have been constantly uploading Hindi learning videos on youtube, I have not changed at all hehe 😛 though now I have got so much mustache and beard in my face 😛 , new Hindi learning website soon I am going to release, which will be very useful for Hindi learners. Awesome!!! So informative… Just one thing that i am still not able to handle verb tenses in hindi.. kya tum meri madad kar sakte ho ? I’ve been watching your clips on YouTube and I just discovered this page of yours. I must say it is fantastic. You’ve done a really good job. Please, please, please could you finish off doing the audios for the remaining verbs. I would really appreciate it as they are helping me learn faster and easier. I tried to also do the same with your adjective list but for some reason the Hindi the adjective list was different and not standard unicode characters. I hope that your students will find this useful. If you have any other vocabulary lists I would be happy to add them to memrise. You are welcome Jenitha bahan. thank you anil,am a native african studing in indian, through this i have learned to understand indians and their culture.thank you! These verbs list are very useful, thanks for uploading. It will be still more easy if you could use these verbs in sentences and provide. I understand your concern dear, Manimozhi I will also add them in coming days dear, stay in touch with my Hindi resources , especially at – http://youtube.com/c/anilmahato, I announce all Hindi related news here. 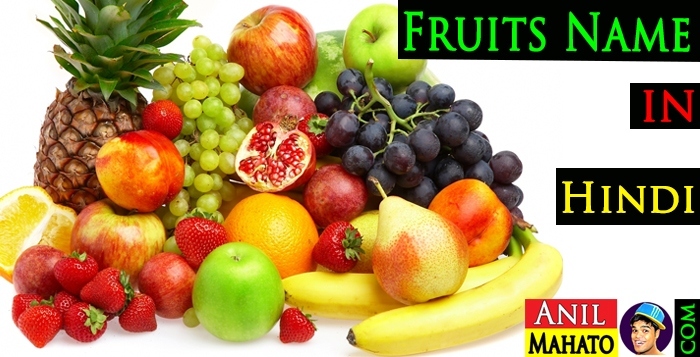 You are exhilarated in teaching, super attitude, you always give easy way of teaching. Could you please suggest any site to watch Hindi serial with English subtitle in order to learn Hindi more. 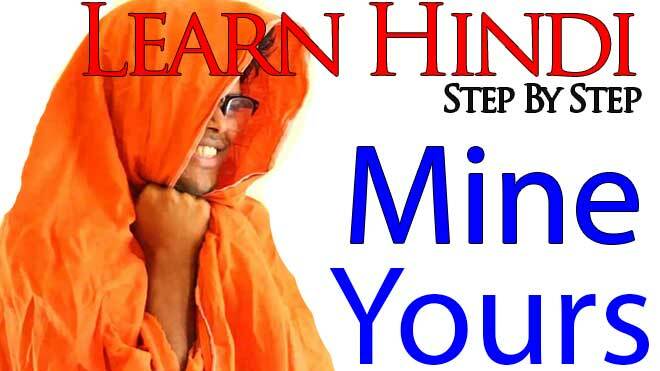 Your videos about learning Hindi are excellent .you r making to learn Hindi in a simple and easy way . Now I am watching about tenses . I am a new comer to this site. Thank you very much bhaiya. You are doing wonderful job. Please continue. I hope you will be noticed sooner or later by the Government of India for your good job and it is my desire you should be awarded suitably, though you are not aiming it but doing your service without expecting anything in return from anybody. Thank you so much Gurunathan R bhai, your comment really motivated me to work more with all love and passion. Thank you.